The Guardian of the Seventh floor of Nazarick, with the form of a demon wearing glasses. 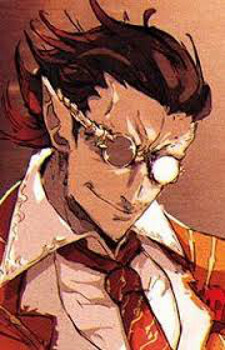 Demiurge is very intelligent, but is also considered the most evil NPC on Nazarick. He greatly enjoys the suffering of others, made clear by his vicious experiments on prisoners. He's in charge of tactics and defenses of Nazarick. Among the Guardians, he gets along the best with Mare, since he understands the more cunning side of the Dark Elf.